Details This product contains lead compounds. Please read the Material Safety Data Sheet (MSDS) before using. 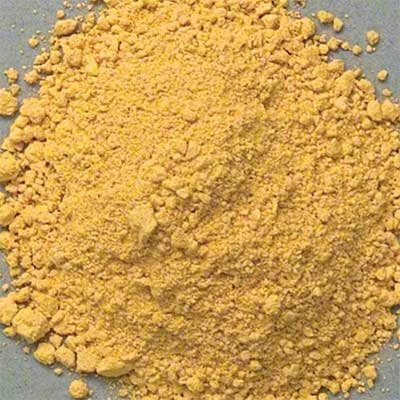 Naples yellow is an artificial pigment made by heating lead and antimony together, which has been manufactured since the 14th century B.C.E. Lead antimonate yellow, known by the name of Naples Yellow, was manufactured as early as the 18th Dynasty (16th-14th century B.C.E.) at Thebes. Since the 15th century B.C.E. it was the only yellow colorant in general use, then it was gradually replaced by lead-tin yellow. Lead antimonate yellow gained its highest popularity in European art between 1750 and 1850 after which it was replaced by lead chromate yellow and finally by cadmium sulfide yellow. Naples yellow is produced by fusing lead and antimony together, yielding a pale to deep yellow pigment that is ground and screened through a fine mesh. A brilliant yellow is obtained by mixing two parts of chemically pure lead nitrate with one part of pure antimony potassium tartrate (tartar emetic) and four parts of sodium chloride (common salt) and purified by repeated crystallization, exposing the mixture for two hours to a heat sufficient to fuse the sodium chloride, and finally dissolving out the sodium chloride with water. If the temperature has not been allowed to rise too high, the Naples yellow is then obtained in the form of a fine powder. The same pigment is also obtained, but generally of a less brilliant color, by fusing equal parts of antimony and lead with three parts of potassium nitrate (nitre) and six parts of common salt. The Colour Index lists two types of lead antimonate yellow: Pigment Yellow 41, No. 77588 and Pigment Yellow 41, No. 77589 that is made by fusion with zinc oxide or bismuth oxide. 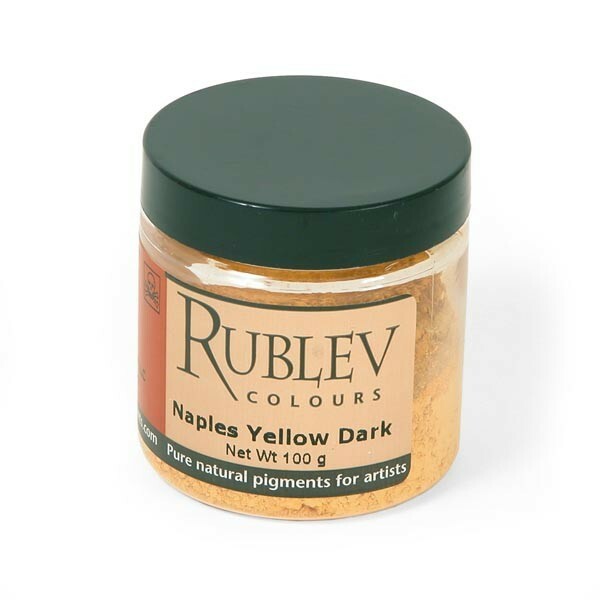 Rublev Colours Naples Yellow Light is pure lead antimonate yellow made by the process outlined above, which is varied by altering the heating time and temperature, resulting in a golden yellow color. 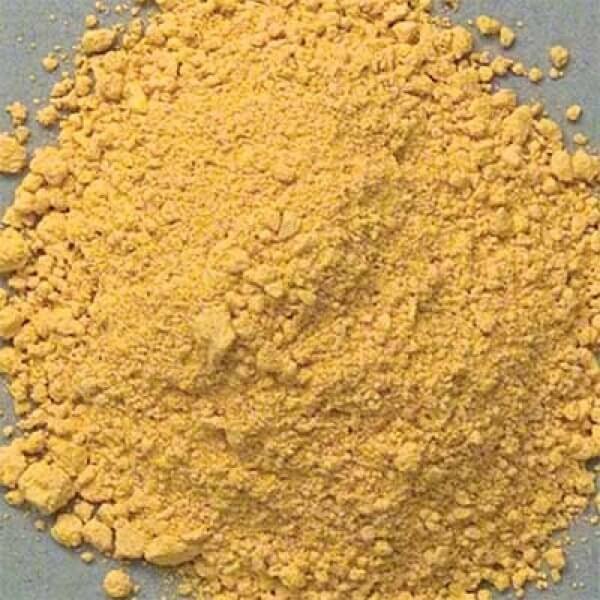 Lead antimonate yellow is alkali fast and is insoluble in organic solvents. Due to the presence of lead it may darken by atmospheric hydrogen sulfide and is therefore more permanent in oil than in watercolor. The pigment is light fast. Lead antimonate yellow is compatible with all pigments except barium yellow in fresco and with all vehicles except those containing acid preservatives. Lead antimonate yellow absorbs a small amount of oil (18 g oil per 100 g of pigment). It has a strong drying effect on oil paint. It is sometimes difficult to grind because of its hardness. When grinding, do not use metal implements as the antimony will abrade the metal and cause discoloration. Lead antimonate yellow contains lead and is rated toxic, especially by prolonged exposure through ingestion or inhalation. Utmost care should be used in handling the dry powder pigment to avoid breathing the dust. It is only moderately toxic in contact with the skin. Density: 6.0 g/cm3 at 20° C.